August 2018 £50 Monthly Golf Ticket Now On Sale! We are pleased to announce that the August 2018 Monthly Ticket is now available enabling you to enjoy more golf at Down Royal Park for only £50 per month. Purchase now and enjoy the additional few days of July combined with your August monthly pass. • Monthly Playing Tickets Can Now Be Purchased At Golf Reception. • These Are Available Now & Will Cover From Today’s Date To End of August, Still For Just £50. • This is 5 Weeks and 4 Days For £50! Amazing Value. £1.28 per day. • Ticket Allows Play Every Weekday and After 9am Saturday & Sunday. 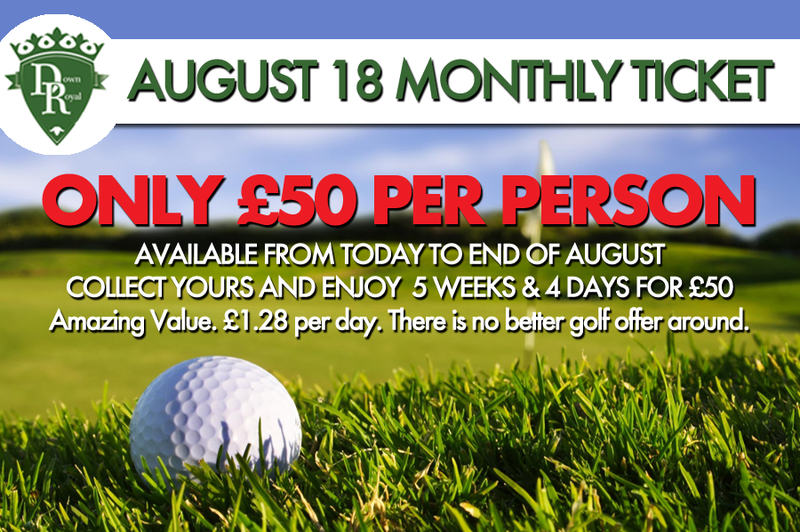 • There is no better golf offer around. Available to use on 18 & 9 hole courses. For further enquiries please call us on 028 9262 1339.